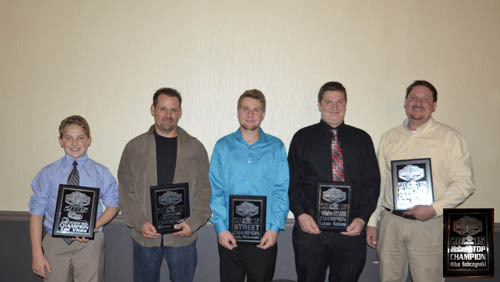 LANCASTER, N.Y. -- Lancaster National Dragway saluted its 2015 track champions during the annual season awards banquet November 13 at the Backstage Pub in Cheektowaga, N.Y. Leading the champions for the Franco's Pizza Friday IHRA Drag Racing program was Steve Ferstl of Burlington, Ontario, who took home $1,500 as the Uncle Bob's Self Storage Quick 16 track champion. Ferstl won three events this while en route to the 2015 track title, which was the first of his career at Lancaster. In McGard Top ET, Mike Sobczysnki of Depew, N.Y. received top honors as the class champion. Sobczysnki's title was decided on a tie breaker with the team of Jan Winkowski and Tom Wieczorek as he had earned one more runner-up finish than the teammates. He earned $1,200 for his efforts. It was the third Top title in a row for the Sobzcysnki family as Mike's brother, Jeff, has won it the two previous seasons. Dale Eckert of South Wales, N.Y. claimed his sixth-straight Mod ET track championship and his ninth in the last ten seasons. Eckert picked up a pair of wins while successfully defending his title for the fifth year in a row. The highlight of Eckert's season might have been August 21 when he won both Mod and Top ET in the same night. He netted $1,200 as the Mod champion. Cody Winkowski earned his first career track title in Street ET. Winkowski won twice in 2015, but narrowly won the championship over Nick Morrissey. Lucas Salemi cruised to the track championship in Hebeler's Sales Bikes & Sleds. Salemi led the class with three wins this season. His back-to-back wins on July 31 and August 7 made him the first repeat winner in the class in 2015, and gave him a leg up in the standings. Salemi pocketed $1,200 as class champion. The track champions for Lancaster's Tuesday night amateur drag racing program and Junior Dragsters were also honored for their accomplishments. Zac Vitez claimed the K-100 Fuel Treatment/Bauer Racing Junior Dragster championship. Shawn Vangraafeiland won the Teen Championship Racing title with two wins during the season. Preparations are already under way for the 2016 season at Lancaster National Speedway & Dragway. The season opener for the drag racing program will be Saturday, April 16 with a Box/No-Box Shootout.